The Pacific Institute has produced this Google Map to show the areas in California in danger from a 100 year coastal flood event. The Pacific Institute estimates that currently 480,000 people; a wide range of critical infrastructure; vast areas of wetlands and other natural ecosystems; and nearly $100 billion in property along the California coast are at increased risk from flooding from a 1.4-meter sea-level rise. Areas likely to be affected are shown in blue. on the map. 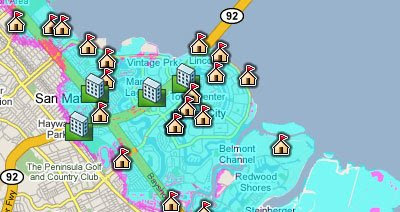 It is possible to view health-care facilities, schools, police stations, fire stations, and wastewater treatment plants on the map, to see which would be affected by such an event.